I generally am working as an acting CTO for about 3-4 start-ups or other companies at any one time. I was just talking with someone who asked me to define how that could work and what they meant. Great question. This helps explain where I normally play. Most often I'm being brought in the early stage, Start-up or Expansion (as the company looks at new product lines). 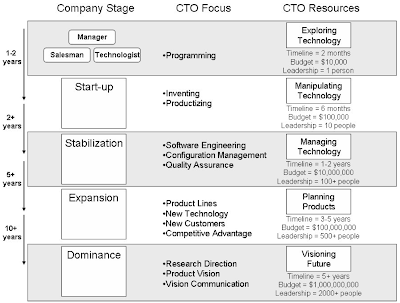 During Stabilization, often the focus is transitioning to a full-time CTO. My focus in this post is on the Early and Start-up stages - expansion is more of a consulting, focused project role and it acts different. So, what is my role as an acting CTO? My role is to work as part of the team to (1) understand related technologies and technical opportunities, (2) understand and help drive alignment around a vision of where the business should go, and (3) mesh those together to help make disciplined, proactive technical decisions. Basically, the role is to support both the business strategy and technical strategy. review and influence business and technical processes to help balance competing needs and priorities. advise the leadership team on business practices that will help to derive greatest short-term and long-term value from the technical team and other resources. Normally there are crude documents for each of these areas that can be quickly read / scanned. If there aren't existing documents, then it means more time to extract the information. Conduct meetings to ensure understanding and alignment around market opportunities, business model, sources of revenue, immediate needs, growth, product opportunities, and ultimately to establish business and product priorities. This gets me going. Normally, its a burst of activity at the start and then things settled down into a pattern with bursts of activity at particular times. Many people ask how the acting-CTO gig can work out. I actually wonder the opposite. During the Early Stage or Start-up Stage, how can you have someone who can handle technical and business strategy AND have them hands-on? It's not a full-time CTO position, so they need to get work done. Instead, what you most often have is a person who is more hands-on who is doing their best at the strategy and there's a gap. You find that the non-technical CEO visionary has trouble directing the action. And the company is likely missing lots of opportunities and is a bit all over the map. 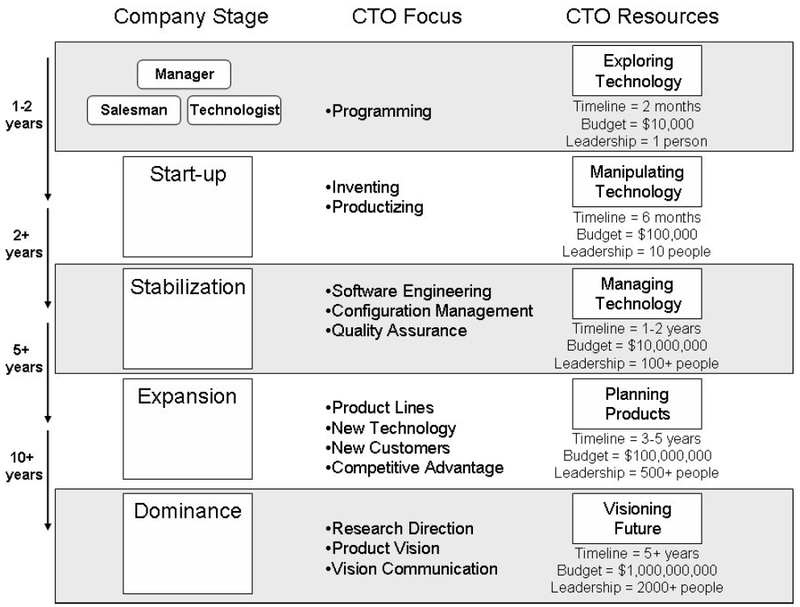 To me, it makes a lot more sense to do part-time CTO (if you have some funding).